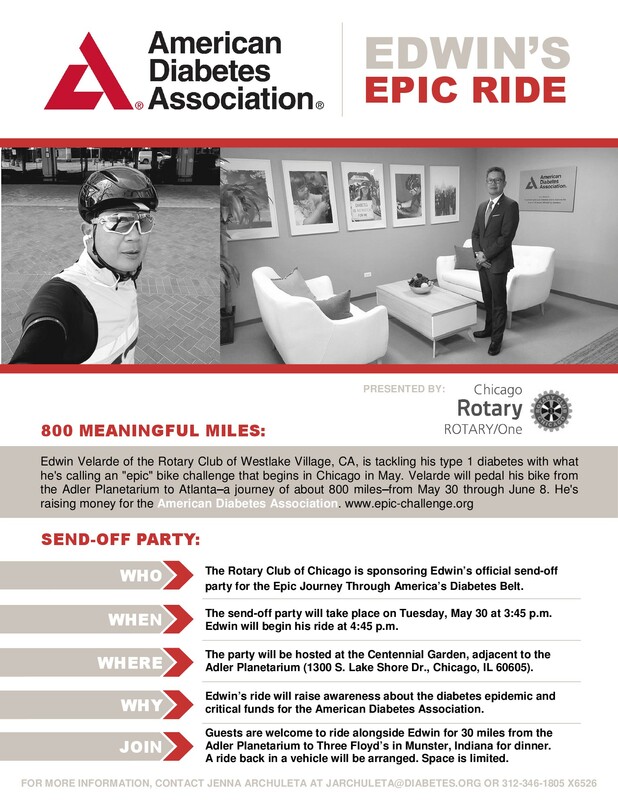 The Rotary Club of Chicago is sponsoring the official send off party for the EPiC Journey Through America’s Diabetes Belt. This gathering will take place on May 30th, 2017 at 3:45 p.m. The send-off bike ride will begin at 4:45 p. m. Guests are welcome to ride alongside with Edwin for the first 30 miles of his journey from the Rotary Centennial Garden (adjacent to the Adler Planetarium) to Three Floyds in Munster, Indiana for dinner (click here for interactive map and to print route sheet). For those that need it, ride back in a vehicle will be arranged. Space is limited. Or, conveniently return to Chicago via Metra. More event details or to print the flyer see below. Edwin’s ride will create awareness about the diabetes epidemic and critical funds for the American Diabetes Association. DONATE NOW to the American Diabetes Association. Contact us regarding the Send-Off. 30 mile ride participants must observe Illinois Bicycle Rules of the Road and Indiana Bicycle Laws.